>>> if you have spent time on the east, you might know what is lake-effect snow is. well, it has started in earnest for the season, and a whole lot of people are paying dearly tonight and have been since last night. our own ron alan has made his way to an i-90 overpass in west seneca , new york. ron , how are we holding up there? >> reporter: the conditions out here are tough. heavy snow is falling. there's two feet or more on the ground in some areas and the big question is behind me. that's i-90. and you can see the lights of a long line of cars and trucks sitting there in gridlock. it started last night around 8:00 when a big truck jackknifed and crashed, blocking hundreds of cars and motorists, leaving them stranded, many through the night and through the day. it is the first major snow tomorrstorm of the season for upstate new york . drivers stranded, sharing mare misery on cell phones on the local evening news. >> the state troopers came through and they said it will be a while. >> well, we started building a snowman. >> reporter: this woman sat in traffic for more than 11 hours. >> it just halted to a stop right around 9:30, quarter till 10:00 . that's where i sat all night until this morning. >> reporter: the blizzard conditions are the latest act of a powerful storm that swept up the eastern seaboard , starting with tornadoes in the southeast. more than 50 homes destroyed outside atlanta. in buffalo, near the great lakes, all the white stuff is what's known as lake-effect snow. lake-effect snow happens when you have cold, arctic air pouring over that warmer lake water which right now is in the low to mid 40s, picks up that moisture and dumps it, creating these lake-effect bands. >> reporter: new york state police say they have no idea when the massive traffic jam will be cleared. but they are giving it all they've got. >> our main objective is get this road open, east bound and west bound, continue to use our atvs to check stranded motorists, make sure no one is in harm's way and hopefully by this evening this will be the tip of the buffalo knife. >> reporter: they are making some progress. at one point the jam stretched for ten miles, it's down to about four miles. the problem now is getting the big trucks out of here. a lot of people, of course, are very tired, angry and frustrated to understand how this could have happened. brian, back to you. >> we're hoping for the best for all those folks in their vehicles. ron alan, thanks. 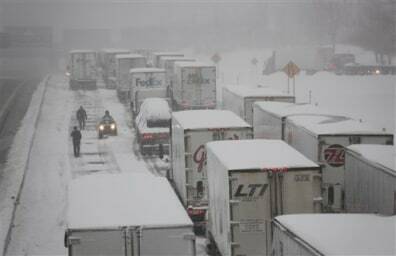 Vehicles are stranded on the New York State Thruway during a winter storm in Buffalo, N.Y., on Thursday.